The image runs on all Apalis and Colibri iMX6 modules. The image has been tested using the Apalis and Colibri Evaluation Boards, those are the suggested platforms for experimenting with the image. Using the Toradex Easy Installer is the recommended way to install Windows Embedded Compact images onto any Colibri iMX6 or Apalis iMX6 module. Only WinCe release V1.2b2 and newer are supported by the Easy Installer. For using the Easy Installer, make sure you activate the boot partition. All other information in this article is not relevant for you. The WinCe image V1.3b2 image may take more than five minutes for the first boot, and it will not mount the \FlashDisk folder. This is a know issue (#31253) and there are two applicable workarounds. To update to image V1.3b4 using the Update Tool you'll need to use the update tool V7.6.0 or newer, because the format of compressed images has been changed. Make sure to update both the image and the bootloader without a reboot inbetween. Windows Embedded Compact image for the iMX6 modules (including Windows Embedded Compact 7 and Windows Embedded Compact 2013) can be downloaded here. The SD card must be at least 1GB. The image can be written using the Win32 Disk Imager tool. launch it and select the eboot.imx file contained in the zip you downloaded. If you plan to use rev.1.2 and the new SPL bootloader you'll have to select eboot-colibri.img or eboot-apalis.img, depending on the module format you are using. If you plan to move to release 1.2 or newer using the new bootloader you'll have to update both SPL and eboot before rebooting your devices. They appear as two separate file types (SPL and SPL bootloader) in update tool. For future updates you will be able to just update the SPL bootloader unless otherwise specified. If you already updated your bootloader and image using the update tool you don't need to use recovery mode or perform an update from the bootloader, so you can skip the next chapters. Recovery mode is needed only if your module is currently booting Linux or not booting at all. If you already installed a previous version of Windows CE you can jump to the "Flashing or updating bootloader" section. Don't insert the SD-card in the slot (you'll need that later). Connect a USB cable to the USB client port of your Evaluation Board and also a serial or USB cable for the serial console (if you use USB cable also for serial emulation check that the jumpers used to choose between USB and regular serial ports are in the right position, check your datasheet for additional information. Open a terminal application (putty or teraterm) on your PC and configure it to 115200 baud, no parity, 1 stop bit an no flow control. On Apalis i.MX6 version 1.0 you need to cross tx and rx signals, to do that you can use jumpers JP10 and JP12 (connect the central pin to the output pin on the other connector). See picture for USB mode. Enter recovery mode as described in the module's datasheet. For Apalis you can use the "recovery mode" button on the mezzanine board or shorten the pads highlighted in the picture and on the datasheet, on Colibri i.MX6 you need to shorten the pads, the recovery mode button on the Evaluation Board does not work on i.MX6 based modules. Remember that the processor checks for recovery mode only on power-up, not on reset, so you'll have to power on the board and not just reset it if it's already powered. Check that nothing has been written on the serial console. If you see some message this means that you did not enter recovery mode correctly. Open a MS-dos command prompt and navigate to the recovery sub-folder of the zipfile contents. If you plan to update to rev. 1.2 and use the SPL bootloader you have to use imx6recoveryfull.bat instead. Succeeded to download XLDR_RECOVERY.imx to the device. On the serial port, you should see bootloader's first messages. Insert the sd card in the slot (on the Apalis EVB you have to use the slot close to the DVI connector) and press space. Power cycle your board to boot from eMMC and continue with module setup. Before you can boot the image you need to update the eboot bootloader. To do that just power on your board with a serial terminal connected to it and press "space" to stop automated boot process. CPU is running at 792000MHz. 16 sectors of configuration data loaded. Initiating image launch in 2 seconds. Loader flashed successfully, reboot to run the new loader. on the command prompt. Since 1.0beta6 the flashloader command will no longer require the destination SD index, it will always write the loader on the internal eMMC, so the second parameter is no longer required. Typing "flashloader" with no arguments will show you the syntax supported by the current version of bootloader. The same applies to the flashimage command, used in the flashing image section. ..............Copy of factory info - 8191. Remember to use flashloader command to be able to boot your module. Configuration settings will be reset to factory default, you should re-apply any modification you made. After enabling usage of the boot partition you'll need to re-flash the bootloader using the flashloader command described in the previous point of this article. New partition method is mandatory if you plan to use SPL bootloader. The windows CE bootloader will start, stop boot by pressing space. Using eMMC boot partition (size: 8192 sectors). 16 sectors of configuration data loaded from boot. Initiating image launch in 5 seconds. Press 'x' to access the bootloader console. Compressed image size is 23629291 bytes. File is a compressed bin file. Writing image from sector 40962 to sector 87113.
instead. But if you plan to flash image 1.0beta6 or later you have to flash the corresponding bootloader first, otherwise the image will not boot correctly. 16 sectors of configuration data stored. Reboot your device and Windows CE will start configured for VGA output. Reading image from sector 40962. If you plan to move to release 1.2 using the new bootloader you'll have to update both SPL and eboot before rebooting your devices. They appear as two separate file types (SPL and SPL bootloader) in update tool. For future updates you will be able to just update the SPL bootloader, unless otherwise specified. Starting from version 1.0beta6 the image contains the Update Tool, this means that bootloader and image could be updated using this tool and without any operation on the bootloader's console. The update tool in version 1.0beta6 has an issue that may lead to a non-bootable image, a fixed update tool release is included in the 1.0 image download package and it's suggested to run that version if you plan to do an update from 1.0beta6. A first release of the Windows CE Libraries is available here. The API is the same supported on Vybrid and described in the official documentation here. 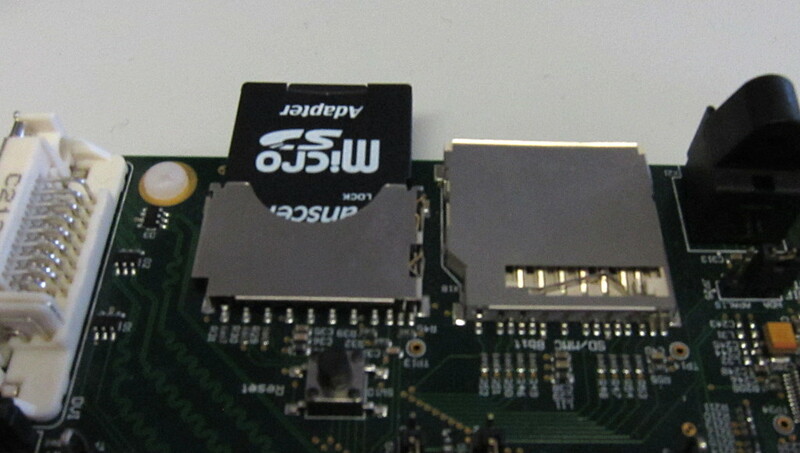 Display output on VGA and Universal Display connector.LVDS output on Apalis. Please check Release details page to get detailed information about the new issues that have been fixed in the different releases and those that are still pending.